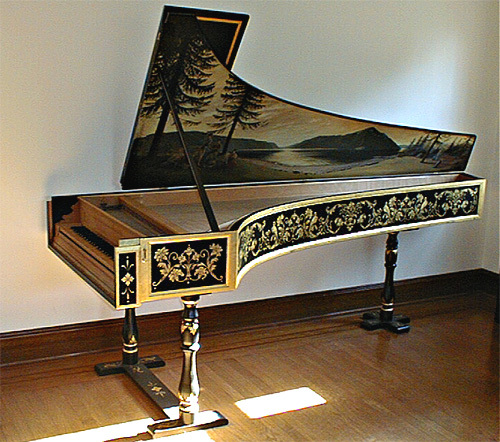 Single-manual Italian harpsichord by Owen Daly based on the 1697 Carlo Grimaldi (from Messina, Sicily) instrument in the Nurnberg collection. A true inner-outer, with the decoration being done on the outer case and not the instrument itself. The owner of this instrument was partial to the Olympic Peninsula and to Lake Crescent in particular so we came up with a landscape featuring a sunset over Lake Crescent and a group of her musician friends. For the case we based the ornament on the lavish decoration of the original instrument, but toned it down quite a bit. I first covered the entire case with gold leaf and then painted the design on top of the gold, using paint which was slightly transparent so that the gold would shine through.